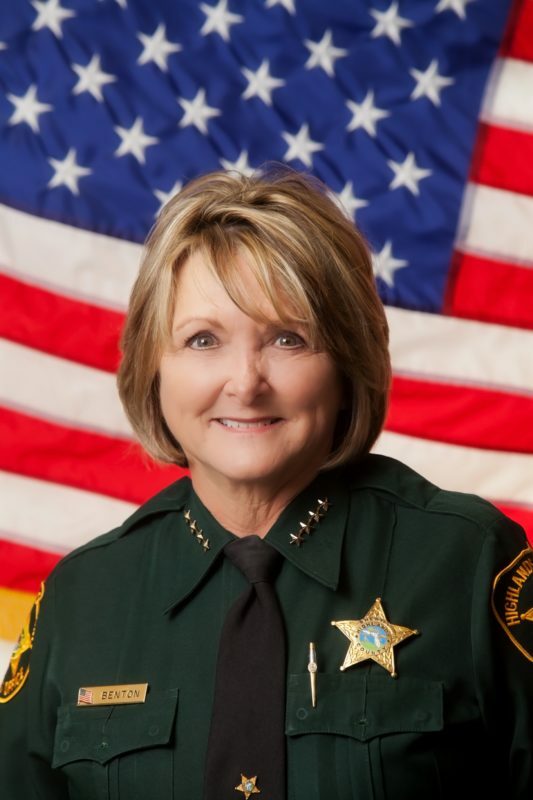 Sheriff Susan Benton of Sebring is the first female sheriff elected in a general election in the history of the state of Florida and is currently serving her third term. Sheriff Benton is a fifth-generation Floridian who has served in law enforcement for over 35 years. She has risen through the ranks by gaining the respect and admiration of her colleagues and superiors while continually seeking her education, attaining a Master’s Degree in Public Administration and Certification as a Florida Public Manager. She has consistently gone above and beyond her duties to serve her community with innovative solutions while pushing for programs such as the Special Victims Unit to protect the elderly and the children from victimization, mentor and educate youth, providing substance abuse and mental health treatment within the jail all while holding offenders accountable. Immediately upon taking office as Sheriff, she created a partnership between the community and the Sheriff’s Office to create its first-ever Strategic Plan. Sheriff Benton’s Strategic Plan facilitation not only involved the community, but all units and ranks within the Sheriff’s Office, another first for Highlands County. Sheriff Benton was the 2013 President of the Florida Sheriff’s Association, which is the first time a woman has served in this capacity in the Association’s 115-year history, and currently serves on the National Sheriffs Association Board of Directors. Sheriff Benton continually promotes the advancement of women at every opportunity and has ensured that education, competency, truthfulness and discernment are the most prominent factors for advancement in the Highlands County Sheriff’s Office. The female representation in the Sheriff’s Office has risen from 17 female employees in 2005 to 45 female employees in 2012. Sheriff Benton’s fervor and compassion have made an impact on both her profession and her community. She is involved in community activities beyond the expectations of her position, and she is dedicated to service for all citizens. Her personal dedication and drive to improve public safety and protect those in need has made her a hero in Highlands County.